If you host family and friends at your home during the holidays, you know how risky this can be to a new carpet. Try as you might to prevent it from happening, someone will inevitably track something in from outside or spill a glass of wine or drop some food on your carpet. Don't be alarmed! There are many easy ways to combat these common carpet stains. Of course, you can always hire a professional and if you live anywhere near Barrie, ON check out Sir Clean Pro for some great deals on carpet and tile & grout cleaning. The best way to treat stains and prevent them from setting is to treat the stain as soon as it happens. The sooner you treat the mess, the less time it has to penetrate the carpet and become a permanent stain in the fibers. Blot the spot gently — do not rub! Rubbing does the opposite of what you want and will actually cause the stain to form faster. Use a spot remover to treat the mess. Work from the perimeter of the spill and spiral inward to prevent the stain from growing in size. Once you finish this, rinse with clean water and repeat if needed. 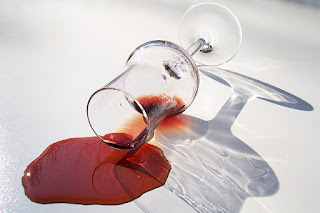 For stronger stains, such as that from a glass of red wine or cola on white carpets, use an aggressive stain remover such as OxyClean Stain Remover for Carpets. Remove excess liquid before spraying the stain remover in a circular pattern. Ensure the stain is completely covered and do NOT rub it in. Wait 5 minutes before repeating. Wait overnight to see if any stain persists, and repeat if there are any markings left over. A crackling fire creates a cozy environment when everyone's over for the holidays, but sometimes soot and ash from the fire can find its way onto your carpet or rug. To treat this kind of stain, use a tough stain pre-treat solution for carpet and upholstery. Use a sponge or washcloth to clean from the outside of the stain inward. Lightly pinch the stained carpet fibers in an upward motion. Make sure not to rub the stain, as that will only make it harder to remove. Oftentimes, these stains can be exceedingly difficult to remove on your own, and your best bet is hiring a professional steam carpet cleaner to tackle your carpet after a long holiday weekend. Not only is this a great way to tackle explicit carpet stains, but it's also great for the health of your family and the quality of the air in your home. Steam cleaning helps get rid of both the carpet spot stains caused by clumsy family members, and all the dirt and irritants tracked in on the shoes of your siblings and cousins and nieces and nephews that marched through your home this holiday.